Absolutely right. Just heard in the news today that a record number of people applied for welfare in the third quarter in Germany. Almost all of them are new immigrants, many not even registered yet because authorities lost track of them as they were (and still are) flooding into the country. If you want really big government spending, you have to tax the middle class. That’s where the big money is. The total pool of income for people making $50k to $200k is far larger than the pool of income income for people making more than $250k. Why? Because there are many more people in the first pool. There are not many Bill Gates! This is why leftists who claim they can expand government by taxing the rich are either lying or ignorant. I Europe, politicians and voters, having “Laffered out” the rich, had to turn on the middle and lower classes. With VAT and a host of other excise taxes on energy, cars, alcohol, tobacco etc. These taxes are less visible and grew organically. They grew organically out of an electorate that dreams of a perpetual motion machine of prosperity — and thus has to fool itself by taking money from one of their pockets, losing a significant portion in the state overhead machine, and depositing the remainder in the other pocket. So once you are being stripped $5000 per year in energy taxes, you get a $1000 “warm winter” heating subsidy — and they’re stupid enough to be thankful. In America, ordinary people are gradually falling into the same self-made net. First in California, then elsewhere. 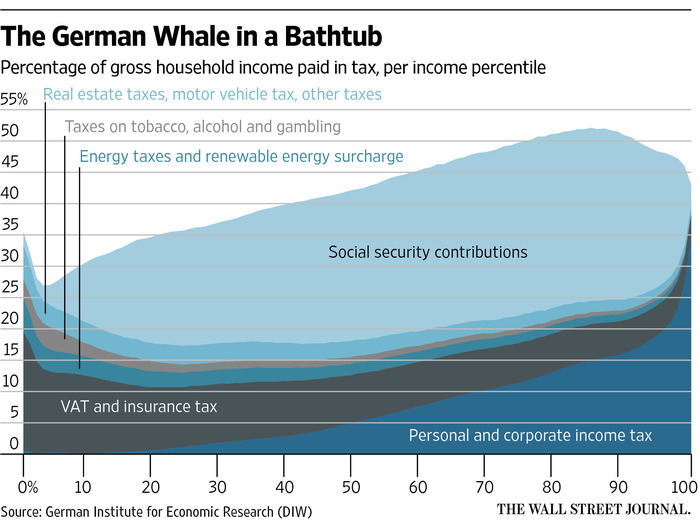 The data from the German Institute for Economic Research (DIW) that you used to illustrate the huge social security bubble of the German society is not even complete. The DIW only used the most prominent taxes alongside social security contributions to make their point. 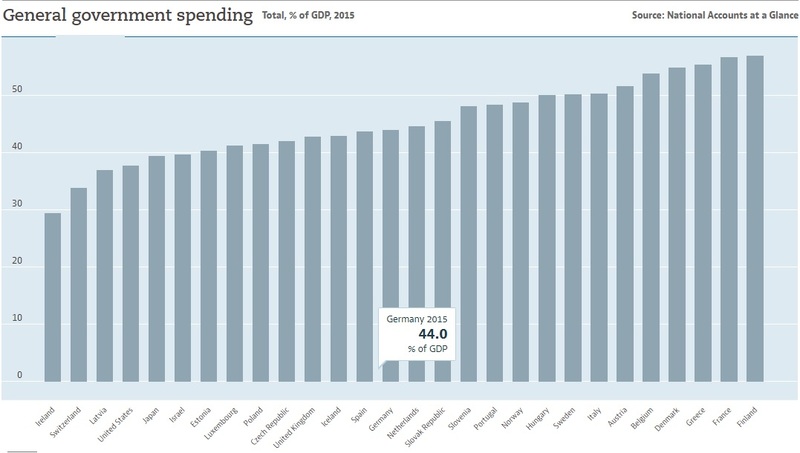 There are far more government taxes, fees and “contributions” than shown in the chart. Last month the German Taxpayers Association published a report about this very subject. And even they forgot to count a few government imposed taxes, fees and the like. Let’s take a we’ll educated German worker at the Daimler automotive plant in Stuttgart (you know Mercedes cars). Daimler pays a very good wage. Let’s assume our worker has been working for Daimler for 15 years and is not married. He also has no children from any former relationship. His monthly wage slip will say something about €6,100 ($7,100 or so) but his paycheck will only read about €3,450 ($4,000). But it doesn’t stop here. This was only income tax (lesser part of it) and social security. He has still not payed any VAT, property tax, insurance tax, car tax, dog tax (yes, that’s a thing), public broadcasting fees, tobacco tax (if he smokes), gas tax, electricity tax and many more taxes and fees. He will end up with around 35 % of what he earns for himself. 35 %!!! But good news: As a family of four with a similar income you will have around 8 % more for your family.